I should start off by saying I’ve never read Ray Bradbury’s novel Fahrenheit 451. I was reading a magazine recently and saw it was being adapted into a graphic novel by Tim Hamilton, who I had no previous experience with. Perusing my local comic shop Big B Comics I saw the graphic novel on their new items wall: Fahrenheit 451 The Authorized Adaptation. The story was first published in 1953 and focuses on Guy Montag, a fireman whose job it is to burn books, just as it’s always been. Thinking is closely monitored and entertainment is provided by the government through interactive television. Guy begins to question his job and it’s values, along the way meeting deviant thinkers and being suspected by his wife and boss. Hamilton’s adaptation presents a thoroughly compelling story: no holes or issues in the story or character development. The visuals are beautiful. 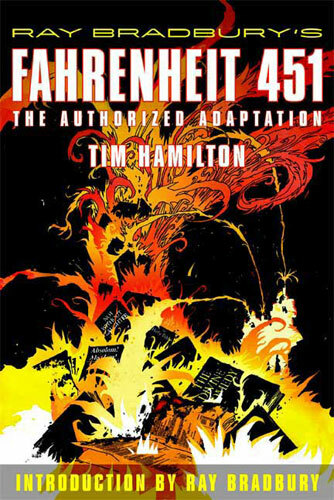 The graphic novel is muted in its colours except for the fire: we are immediately presented with a gray tone to mimic the characters censored lives. Page layout isn’t ground breaking but it striking and moves us along without difficulty. Hamilton’s style is clean: he uses a lot of black that plays into the atmosphere. All in all an excellent work.